Web Applications work on HTTP protocol. HTTP protocol is a stateless protocol, meaning it does not retain state between user requests. Let's understand the stateless nature of the HTTP protocol with an example. Create a new asp.net web application project. Drag and drop a TextBox and a Button control onto the webform. Change the Text property of the Button control to Click Me. At this point, double click the button control, which should generate the event handler in the code behind file. Modify the code behind file, so the code in WebForm1 class looks as shown below. 1. In the scope of WebForm1 class, we are creating an integer variable ClicksCount which is initialized to ZERO. 2. On the Page_Load() event handler, we are setting the Text property of TextBox1 to ZERO. We do this initialization, only, when the request is an initial GET request. 3. In the Button1_Click() event, we are incrementing the value of the ClicksCount by 1, and then assigning the value to the Text property of TextBox1. With this code in place, run the application, and click the Button. We expect the count to be increased every time we click the button. When you click it the first time, it gets incremented to 1. After that, no matter how many times you click it, the value stays at 1. This is because of the stateless nature of the web applications that work on HTTP protocol. So what actually happens when you make a GET request for this WebForm1? When we compile this project an assembly is generated. Since the name of the project is ViewStateDemo, the name of the assembly will be ViewStateDemo.dll. So when a request is made for WebForm1, The application's assembly(ViewStateDemo.dll) creates an instance (object), of WebForm1, initializes ClicksCount to ZERO, and set's the TextBox1.Text to ZERO. As this is the initial GET request, the Button1_Click() event will not be executed. At this point the web server, generates the HTML to respond to the request, and posts that response back to the browser. It then immediately destroys the instance of the WebForm1. The browser receives the HTML, and we should now see textbox set to ZERO. What happens when we click the Button on WebForm1? When we click the Button, the WebForm1 gets posted to the server. This is a PostBack request, NOT A GET REQUEST. So, when the webform is posted back, a new instance of this webform is created again, initializing the ClicksCount variable to ZERO. This time, the code that is wrapped between IF(!ISPOSTBACK) block is not executed. Button1_Click() event gets executed as this is a PostBack event. ClicksCount is incremented from 0 to 1. The value is then assigned to the Text Property of TextBox1. Generates the HTML, sends it to client and destroys the webform. At this Point, we should see the value increased to 1. What happens when we click the Button on WebForm1 again? When you click the button for the second time, the webform gets posted back again. A new instance of WebForm1 is created. ClicksCount initialized to ZERO. In the Button1_Click() event, the value gets incremented to 1 and assigned to TextBox1. HTML gets generated and sends it to client and destroys the webform. So, no matter how many times you click the Button, the value of the TextBox, will not move beyond 1. Now, let's see, how to preserve the state between requests using ViewState variables. Re-write the code in WebForm1, as shown below. Click the Button now, and the value gets incremented every time we click. So how is this possible now. It's possible because, we are using the ViewState variable Clicks to preserve the data between requests. The ViewState data, travels with every request and response between the client and the web server. Now, let's try to achieve the same behaviour, without explicitly storing data in a ViewState variable. Modify the WebForm1 code as shown below. Upon clicking the Button, the value gets incremented correctly as expected. This is possible because, TextBox1 is an asp.net server control, that uses viewstate internally, to preserve data across postbacks. Because Web forms have very short lifetimes, ASP.NET takes special steps to preserve the data entered in the controls on a Web form. Data entered in controls is sent with each request and restored to controls in Page_Init. The data in these controls is then available in the Page_Load(), Button_Click(), and many more events, that occur after Page_Init() event. We will discuss about, all the events in the life cycle of a webform and the order in which they occur in a later video session. An HTML control can be converted in ASP.NET server control, by adding runat="server" attribute in the HTML source as shown below. Now, if you type TEST and click the button, both controls now retain state across postback. ViewState data is serialized into base64-encoded strings, and is stored in Hidden input field __ViewState. To view this hidden input field, right click on the browser and select "View Page Source" for google chrome. In internet explorer, right click and select "View Source"
i tried the second code without viewstate, but txtbox as server control . but as i click my button , the value is 1 and is not incrementing. do i have to change any property of textbox? Hi Sneha, there is not need to change any property of the textbox. If you are using an asp.net textbox control, it should retain it's viewstate automatically. 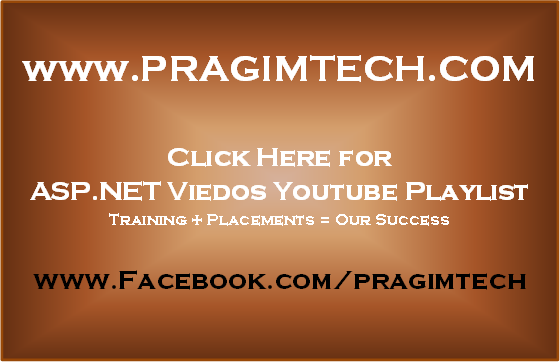 Please watch video Part 3 from asp.net video tutorial at the following link. That should solve the issue you are facing. Could you please add LINQ and ENTITY FRAMEWORK TUTORIALs soon? I learned lot from your tutorials and it was the BEST I could find from internet. Super of JOB SIR. if i need to disable asp textbox view state Its not working! how can i set textValue to htmlControl(textField)? You have to use jquery ajax to set the value of Html Control(textField) otherwise you have to make server Control. textbox control is retaining it's value even when view state mode for the control is disabled.what's the reason for this and if view state does not have any effect on the control when the mode is disabled then why this property is available for the control. I believe this behaviour is due to inheritance nature of controls.Just give a thought All controls(Textbox,Labels etc) inherits webcontrol class and webcontrol class inherits control class.The signature of LoadViewState and Save Viewstate is in Control which is overridden by webcontrol, Thus TextBox gets this behaviour in legacy (though it is of no use since controls like textbox implements IPostBackDataHandler due to which the state of data is maintained accross postbacks no matter EnableViewState is set to true or false)......I think since this behaviour is not impacting the functionality of textbox microsoft didn't bother to seperate this functionality). Please suggest me one think,regarding asp.net in c# .. whenever we take button from tool box to design. All running ok. But when ever i double click on button then there is no window coding is find.. but i will ok to see the viewcode by right click on button. But my issue is that .. why protected void button1_Click(object sender,eventarg e) not getting in view code? Your tutorials are helping me very much to expertise in .net skills,your valuable effort is appreciated. Not Showing any value in TextBox why?? The toolbox is empty. How do I get it to work. I get "No results found" whenever I search for anything. It is one of the great Blog to learn about ASP.net ,Which ever i have seen,it will help the Beginners to learn the concepts. Hi, where can I able to get your asp.net tutorial for beginners full text version like PDF. If u are already have it can u please send that text version or at least send me the link. If it is html input(text) then how can i use viewstate because viewstate common for all the web applications.Then how can i hold/preserve the text value for html control. Thanks vancket sir to make a blog for beginnerand intermediate.